Tactical flashlights are the most important accessory you can install on your shotgun. These units will help you acquire your targets in low-light conditions, and it will allow you to differentiate friend from foe. But did you know that the best shotgun lights can offer a battery shelf lifespan of at least 10 years? In the following article, we review the top 7 shotgun lights currently available on the market. Further, in the article, we take a look at how the different functions and features of the flashlights can influence your shooting experience, and we explain how to choose the best model for your needs. The Streamlight TRL-1 is one of the most popular shotgun flashlight models, and it’s easy to see why. This unit is made out of machined aluminum, and it is capable of producing up to 800 lumens. The beam this flashlight produces has an intensity of 15,000 candelas, and it will illuminate everything in your sight. One of the advantages of choosing this model is that it comes with an ambidextrous switch that will allow you to turn both the flashlight and the programmable strobe on or off. As far as the range of the flashlight is concerned, the 15,000 candelas intensity will allow you to reach objects placed at up to 800 feet in complete darkness. The machined aluminum body is shock-resistant, and the flashlight will support both the powerful recoil of the shotgun and the usual wear and tear without any problems. The TLR-1 uses two CR123 batteries for power, and a battery set and last of up to 1.75 hours of continuous use. Overall, this is a great tactical flashback that’s well-worth its price. 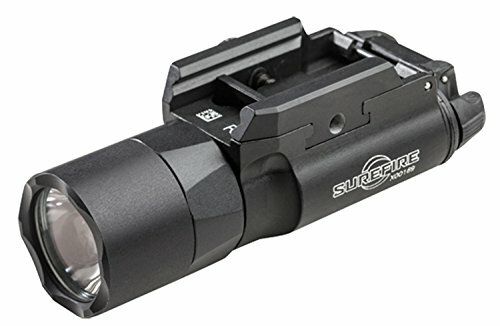 The SureFire X300 is a great tactical flashlight that uses LED lights to illuminate your target. 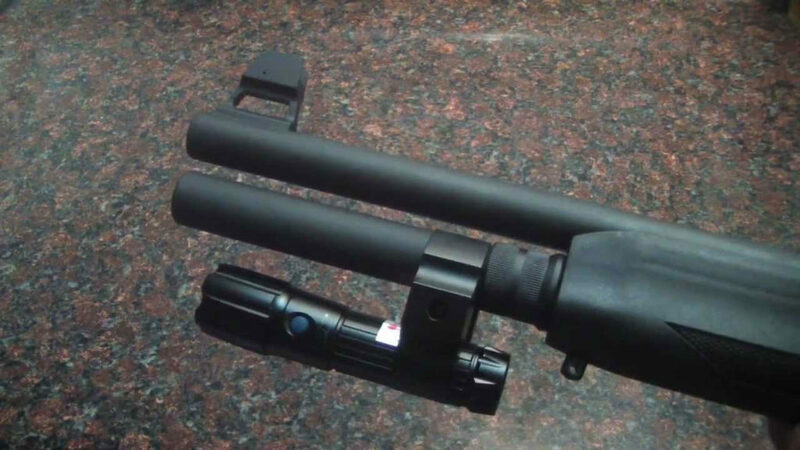 This unit comes with a T-slot mounting rail that will allow you to install it on a wide variety of firearms. A great thing about the X300 is that it’s very easy to use. The flashlight comes with a switch that’s located on its rear that can be activated easily with each hand. You can turn the unit on with a simple press of the button, and use the same button to turn it off. As far as the light goes, this unit produces up to 600 lumens of light in the yellowish-green spectrum that’s optimal for the human vision. The X300 uses CR123 batteries as a power source, and it has a shelf life of at least 10 years. This tactical flashlight has a strong aerospace aluminum casing that will protect it against the recoil and the usual wear and tear. The front lens comes with a weatherproof O-ring that will allow you to use the unit in all kinds of weather conditions with good results. All in all, this is a great tactical flashlight that will last a very long time. The Streamlight Polymac LED flashlight offers a broad range of applications and comes at a great price. This unit uses the C4 LED technology to produce a powerful light that can reach up to 275 lumens, and the concentrated beam can illuminate the objects in front of you, as well as those in the periphery. One of the advantages of using this model is that it’s very reliable. The Polymac flashlight uses the C4 LED technology that can run for up to 50,000 hours, and it has a parabolic reflector that will concentrate the light beam so it will illuminate a wide area in front of you. 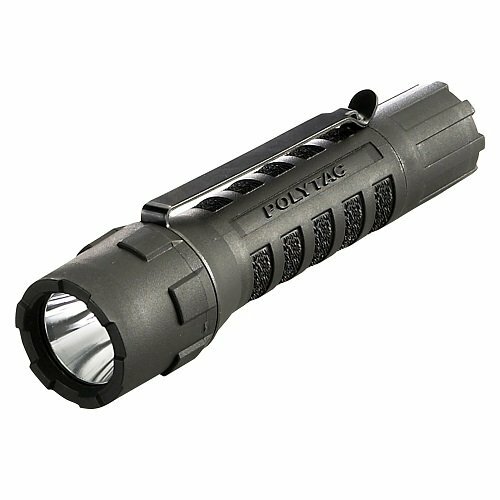 The Polymac is powered by 2 CR123A batteries that provide enough energy for the flashlight to run for up to 65 hours when the low-light mode is engaged. When you’re using the high mode, the batteries will last for up to 3 hours, and for up to 5.5 hours when the strobe mode is engaged. This tactical flashlight is made out of a high-impact polymer that’s very durable. The flashlight’s exterior has a textured surface that will allow you to hold the flashlight securely when needed, and the front lens is sealed by an O-ring. Overall, this is a great tactical flashlight that comes at a great price. The UTG Defender is a good tactical flashlight that comes at a decent price. This model is made out of strong aluminum, and it’s compatible with both Picatinny and Weaver rails, but it can also be held comfortably in your hand when necessary. A good thing about this model is that it uses a high-quality Xenon light bulb and a powerful reflector. The flashlight’s light output is of 126 lumens, and the reflector will concentrate the light beam in front of you, illuminating everything in the center and the periphery of your view. 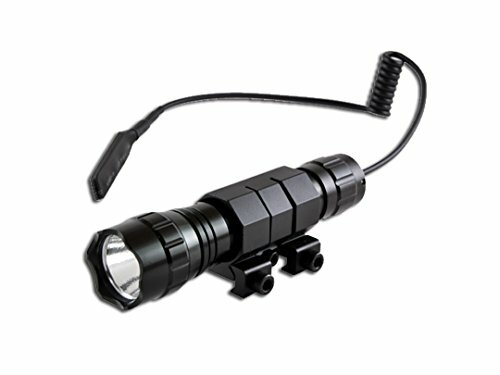 The UTG flashlight offers multiple light activation mechanisms. When you fully turn the cap, the light turns on and stays that way. When you turn the cap slightly, you gain a push-and-release control over the flashlight. If you install the flashlight on the front of your shotgun and you can’t reach it easily, you can turn it on using the remote pressure switch. All things considered, this is a great tactical flashlight model that’s very easy to use and comes at a nice price. Another popular model, the Orion H40-W is capable of producing up to 500 lumens, and the LED lights it uses are some of the brightest you’ll find on the market today. This model is easy to install, and it’s compatible with both Weaver and Picatinny rail mounts. Once you have it installed, you can truly appreciate the quality and durability of the flashlight. This model is made out of strong aluminum, and it will withstand the recoil of the shotgun without any problems. As far as the light’s quality is concerned, this model can produce up to 500 lumens of light. The smooth aluminum reflector will concentrate the light particles in a powerful beam that can illuminate objects that are placed up to 175 yards away. The flashlight uses 2 CR123A batteries for power, and a single set of batteries can offer up to 75 minutes of continuous use. Overall, this is a high-value item, especially if you factor in the price. 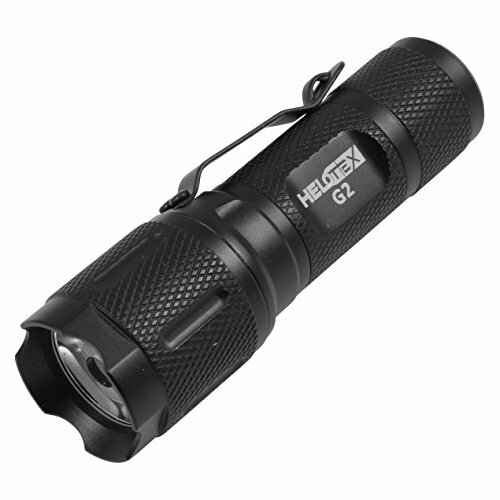 The Halotex G2 is one of the few cheap tactical flashlights good enough to be included on our list. Even though it comes at a cheap price, this model can hold its own when compared with more expensive items, and its a viable solution for everyone who is looking for a tactical flashlight but has a limited budget. This model can run on either an AA battery or a CR123 battery, but its power output will be different for each of them. If you power the flashlight with an AA battery, the unit will produce only 120 lumens. When you use the CR123 battery, the power output will rise to 130 lumens. The AA battery can provide enough power for the unit to run for up to one hour, and the CR123 can last for up to two hours. The G2 uses a Q4 LED as a light source, and it has three operating modes. You can either toggle the high or low illuminating modes, or you can engage the strobe feature. The unit comes with an ambidextrous tactile on/off button that’s placed on its rear, and it’s very easy to use. Overall, this is a good tactical flashlight that comes at a good price. 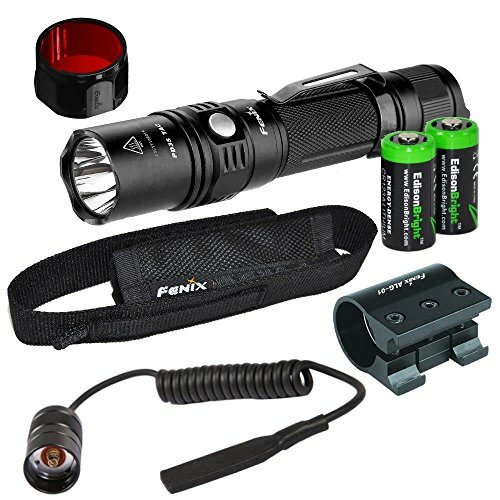 The Fenix tactical flashlight is a good model that’s capable of producing up to 1000 lumens. This unit is made out of stainless steel and it can withstand both the shotgun’s recoil and the usual wear and tear without any problems. One of the advantages of using this model is that it can use both a rechargeable battery or two CR123A batteries for power. Not only will the rechargeable battery lower your maintenance cost in the long run, but being able to use CR123A batteries in its place means you will be able to replace it quickly if it runs out when you’re in the field. Another good thing about the Fenix is that’s very easy to use. You can turn the unit on and engage all of its features by pressing the rear button. This unit also has a good lifespan. The batteries can last up to 29 hours when you use the low-light mode, and up to 70 minutes when you use the turbo mode. All in all, this is a good tactical flashlight that’s well worth its price. Finding the best shotgun flashlight can be difficult if you don’t know what to look for. There are a lot of models marketed as being the best, but many of them are not very efficient, despite their high prices. In the following section, we explain how each of the flashlight’s characteristics can influence your shooting experience, and how to find the best model for your needs. Unlike regular flashlights, most tactical flashlights offer multiple light modes. Even though this might not seem important at a first glance, each light mode offers some kind of benefit. Low-light Mode – The low-light mode is the energy-saving feature of the tactical flashlight. This mode produces enough light to allow you to walk, interact with different objects, and illuminate the path you’re taking, but it won’t produce a powerful light beam. The main advantage of having this mode is that it doesn’t use a lot of power, so you will be able to use it for a long time without draining the flashlight’s batteries. Strobe Mode – The strobe mode turns the light on or off in a particular rhythm, and it can be used either as a signal for your partners or as an instrument to blind and disorient any potential attackers. This light mode usually produces the maximum amount of lumens the flashlight is capable of, so it will drain the battery at an accelerated rate. As a rule of thumb, tactical flashlights are easy to use (as easy as pistol lights) if you are familiar with shotguns. Most of them have an ambidextrous design, so you can turn them on and off using either hand. Here are some features that make tactical flashlights more user-friendly. Remote Operation – When you’re installing the tactical flashlight on the front of your shotgun, it can sometimes be difficult to reach and turn it on directly. Luckily, some models like UTG Defender Tactical Flashlight come with a remote controller that will allow you to turn it off without having to take your sights off your target. Push-To-Use – Even though they’re an essential tool for your hunting and home-defense shotguns, tactical flashlights can have a high maintenance cost because they drain batteries pretty quickly. Some manufacturers thought about this and created a push-to-use system that allows you to turn the flashlight on just when your finger presses the on/off button. This will allow you to use the low-light function to illuminate your path and push the button to illuminate farther objects when you deem it necessary. Rechargeable Batteries – Some models, like the EdisonBright Fenix, use rechargeable batteries for power. Thanks to the rechargeable batteries, these units have a lower maintenance cost. Multiple Power Sources – Even though using a rechargeable is an advantage, this feature can quickly become a disadvantage if your batteries run out while you’re out on the field. Without a power source, the tactical flashlight becomes useless, no matter how good it is. That’s why some models can use multiple power sources. When the rechargeable batteries run out, you can simply change them with normal ones and keep hunting or trekking. You can always keep a spare set of batteries in your tactical vest knowing that you have a safeguard if something goes amiss. 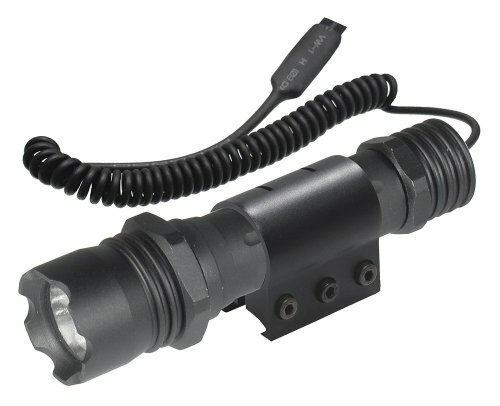 Mounting Platforms – Some tactical flashlights come with their own mounting platforms, while others come with simple mounting rings that should be fitted on your shotgun. Whether they come with a mounting platform or not, one of the first things you have to check is whether the flashlight is compatible with your firearm or not. If the mounting platform or ring is not compatible with your shotgun, you can always buy a new one. Shotguns are some of the most common firearms used in home-defense scenarios, so shotgun lights can often make the difference between acquiring your target quickly and protecting your home or not. One of the most important features for a tactical flashlight is the brightness. Using a bright flashlight can offer multiple advantages, one of them being the ability to tell friend from foe. A good way to determine a flashlight’s power output is to take into consideration the number of lumens it produces. However, not only the lumens matter when it comes to the light produced, the quality of the reflector is also important. Depending on its design and quality, the reflector will either concentrate the light beam in a neat line that will illuminate the center of your view, or it will dissipate the light particles over a wide surface. Depending on how you’re planning on using the tactical flashlight, you can either choose a model that will illuminate far, or choose one that illuminates over a shorter distance but at a wider angle. Durability is another very important feature you should take into account when shopping for a shotgun light. Unlike normal tactical flashlights, the models you mount on the shotgun have to be able to withstand the powerful recoil of the firearm. This means you should look for flashlight models that have a powerful construction, made out of either aluminum or steel. However, there are some models that are made out of plastic and can still suffer the powerful blast of the shotgun without any problems. When you’re considering the durability of a shotgun flashlight, you should also take into consideration the mounting platform you’re using to secure the unit to your firearm. Most of the times, the recoil will affect the mounting platform more than it will the flashlight itself, so you should be careful to choose strong and durable platforms as well. The size and weight of the tactical flashlight are also factors you should consider. Shotguns are by no means small and compact, but they don’t offer the same mounting possibilities as rifles do, so the size of the flashlight can influence the possibility of installing other accessories on the rail as well. Since the flashlight will be mounted on the front of your shotgun, it can affect the way your firearm behaves, especially after you fire a round. This is why you should always take some practice shots after installing the unit on the shotgun. You might be surprised to find out that your second round is not as accurate as it was before installing the flashlight. Even though most of these units are lightweight, they might still affect your aiming, especially if you’re not used to the extra weight. As you could see from our short reviews, shotgun tactical flashlights come in different price ranges. You might be wondering if the extra cost is actually worth it, or if you’re just throwing money away when you could buy a cheaper product. Here’s the deal, most of the flashlights offer different features, so they come at different prices. If a unit produces more lumens, if its battery has a longer lifespan, and if its casing is made out of a more durable material, it will cost more. Sure, some brands are also more expensive than others, but that doesn’t really raise the price too much. You should take into consideration how you’re most likely to use the flashlight. If you’re going to use it for hunting, you should buy a model that’s able to produce a lot of lumens and illuminate over long distances. This will allow you to acquire more targets and take more precise shots. Before you decide, check this post: Predator hunting lights! If you’re planning on using the flashlight on your home-defense shotgun, you should look for a model that comes with a good shelf battery lifespan. Since everybody would prefer not to use that shotgun very often, it’s always better to be sure the flashlight actually works when you need it. Having a long shelf time will also lower your maintenance costs because you won’t have to change the batteries very often. 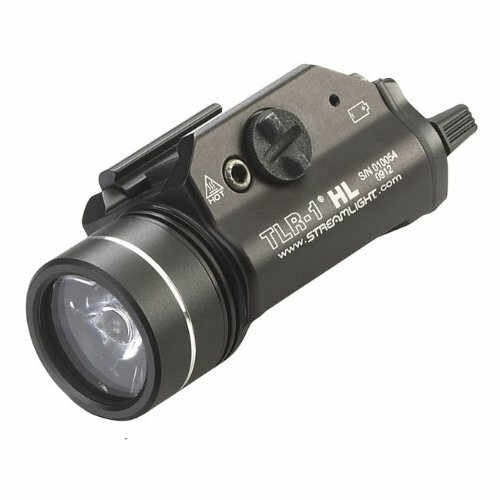 For tactical purposes, you should look for flashlights that produce a bright light and come with a good strobe feature. Using this feature can blind and disorient your opponents, and it can provide a good advantage. Installing a tactical flashlight on your shotgun should be a priority, especially if you use a shotgun as a home-defense firearm. These devices come at reasonable prices, and they can provide multiple advantages. Using these flashlights in a home-invasion situation will allow you to tell friend from foe, and it will increase your shooting accuracy and precision. We hope that our short buying guide provided enough data to help you make an informed decision on which are the best shotgun lights for your needs. Maverick 88 Review: Exactly How Insane is This Mossberg 12 Gauge? Beretta A300 Outlander Shotgun Review: A Powerful Semi-Automatic? Benelli M4 Review | Does it Live Up to the Hype?